When Mitsui Fudosan America (MFA) bought 527 Madison Avenue in 2008, Jim Frederick likened the interiors to a traditional English library. Crisp, polished and befitting the building’s pedigree within the Plaza District enclave of hedge funds, family offices and private equity firms, it had been built just 20 years earlier by the Louis Dreyfus Property Group, now Property Group Partners, and admired for its “extraordinary” massing. But the times they were a-changing. Before 527 could get a new look, however, MFA had to sort through what it had. Over the next three to four years, 40 percent of the building would empty out due to M&A activity or a tenant’s need for a larger floorplate. Frederick, now a vice chairman with Cushman & Wakefield, and his team worked with existing tenants, addressing annual leases with early renewals and creating staggered expirations. The team went through 10 to 20 percent of the building every year, he estimates, and, with every floor, the space was completely overhauled. 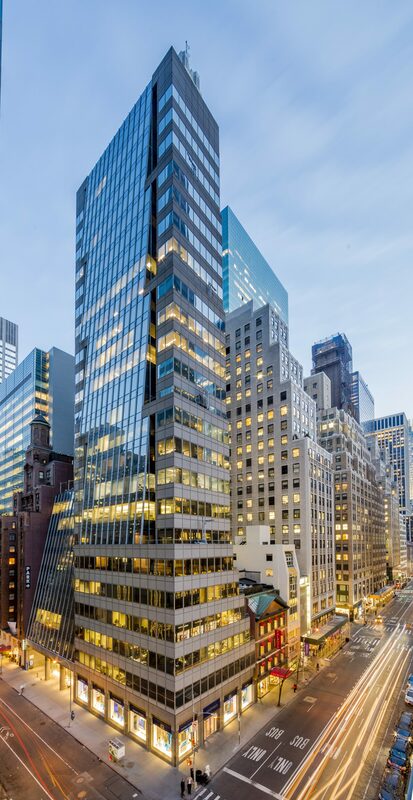 When the Sumitomo Mitsui Trust Bank decided to relocate and consolidate at MFA’s nearby 1251 Avenue of the Americas, the owner commissioned a new, modern lobby by MdeAS with polished marble tile, upgraded the elevators and introduced state-of-the-art security. Frederick, Purcell and Hines property manager Chris Linville then started working with art consultant Jay Grimm and came up with a rotating gallery concept for the new-look lobby. A new, setback terrace was created on the 10th floor for every tenant’s use and the call went out for architects to design efficient, flexible, sustainable office spaces. Three weeks after Sumitomo moved out, the Community Counselling Service Co. leased one of four floors previously occupied by Sumitomo. It was around then that MFA made its boldest move, according to Frederick. According to C&W research, there were 41 direct full-floor availabilities between 10,000 s/f and 15,000 s/f in the corridor at the time – and only three were full-floor pre-builts. Open, collaborative space with fewer rooms and walls made of glass instead of sheetrock. The pre-built was created with full-height glass office fronts and doors, a recessed ceiling over open-plan desks, lounge-style breakout areas and constructed offices and conference rooms. An open-concept kitchen has quiet cover plank flooring and stainless-steel appliances and the expanded bathrooms are detailed with artist tile. When the showpiece was ready, potential tenants could see a turnkey space altered to suit their needs. The 12,000 s/f floor was also considered an example of the building’s standard. “Having that one space helped to lease six other floors,” Frederick said. The latest lease is an expansion by SkyBridge Capital, an existing tenant, that is relocating to take the newly completed pre-built fourth floor, vacating its 8,102 s/f office on the 16th floor. SkyBridge’s relocation along with four expected move-outs in the first quarter due to expansion needs provides rare space options for a building that’s almost always nearly fully leased leased. “It’s an unusual window of opportunity at 527,” said Frederick, who expects brisk leasing activity, mirroring recent years. Last year, four new tenants moved in from within the submarket, including a law firm, a real estate private equity firm, a global investment bank, and an alternative-investment platform provider. These followed four others signed in early 2017, along with two renewals. Frederick believes the success of the program lies in the owner’s reputation for construction expertise and building out spaces to the unique specifications of tenants in the 6,000 to 13,000 s/f range. MFA also set the building apart by providing other enviable features many tenants want, but are hard to come by in a building that size, such as an outdoor terrace and access to an underground parking garage. As the showings at the midtown grand dame continue, the management and leasing teams are celebrating another achievement — the sale of a painting from last quarter’s lobby gallery.